Most homeowners buy central air conditioning for cool, quiet comfort when its hot humid outside. Not all central air conditioning operates the same way, so you should be aware of the following situations and features for peace of mind before you buy. If you want to enjoy your backyard in the summer, choose the right product and right location for your outdoor unit. To reduce cost it should be placed in the closest location to your furnace. Don't buy an oversized central air conditioner. It will cool the air too quickly during short operating cycles and never remove the humidity. A properly sized unit will remove that cold, clammy feeling. No Cooling? No problem! We offer 7-24 hour EMERGENCY SERVICE in Halton Hills and the surrounding GTA Area. 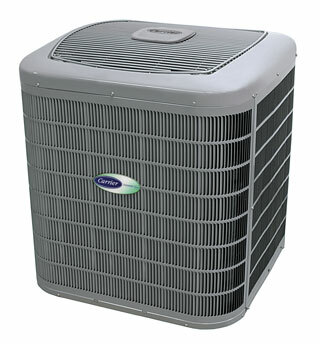 We are proud to specialize in the Carrier line of air conditioners. Contact us regarding the newer, higher efficiency models that save you on hydro operating costs! An air-conditioning system provides cooling, ventilation, humidity control and even heating (if using a Heat Pump) for a home. W. H. Carrier invented it in 1902, and we have led the market ever since. We offer the highest efficiency in central air conditioning you can buy, and with our Puron® Refrigerant—an environmentally sound refrigerant designed not to harm the earth’s ozone layer—complete comfort does not harm the world around you. When comparing different systems, always look for high Seasonal Energy Efficiency Ratios (SEER), which measure the cooling efficiency of an air-conditioner, but also for quiet operation and ease of use—you’ll be glad you did on those hot summer nights. SEER (Seasonal Energy Efficiency Ratio) is the measure of efficiency by which the cooling process of air conditioners and heat pumps is rated. The higher the SEER number, the greater the efficiency—and therefore the greater your energy savings. Today, Canadian regulatory bodies require all new products to have a 13.0 SEER rating or better. Carrier's full line of air conditioners offers SEER ratings of 13.0 to 21. ENERGY STAR® is the mark of high-efficiency products in Canada. The familiar symbol makes it easy to identify the best energy performers on the market. ENERGY STAR certified products meet strict technical specifications for energy performance—tested and certified.